On a rainy Sunday, on a technical criterium course that included cobbles, MHC’s Kyle Knott finally had the opportunity to sprint for the win, and he did not disappoint. Sprinting from out of a 9-man breakaway that formed early in the 60 minute race, Knott entered the final corner in 5th, came out of it in 3rd, and came across the line in 1st, bringing MHC one of its biggest victories to date. Eric Thompson and Zach Felpel from Lees-McRae finished 2nd and 3rd; Thomas Brown from Emory was 4th; and Ben Zawacki from Clemson was 5th. Knott has consistently won field sprints all season, demonstrating his speed, but this time he made the break, suffered to hang on, and it paid off with a big win. 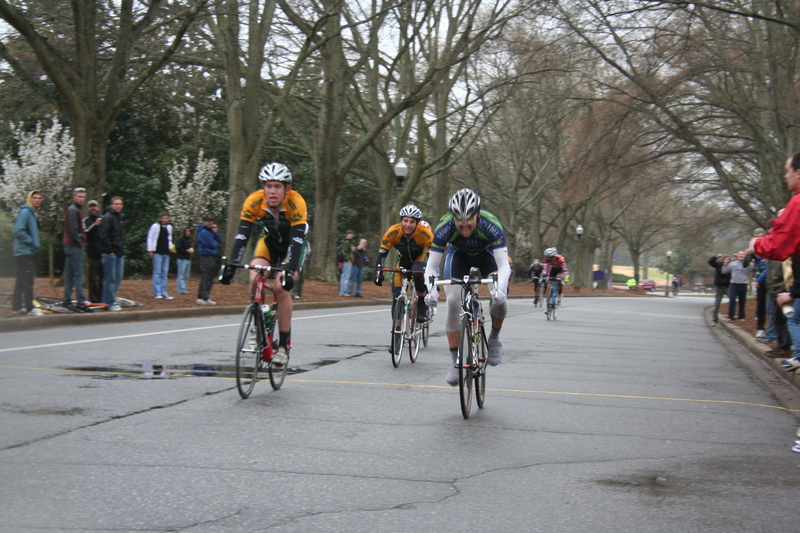 The 9-man break never worked smoothly together and constant attacks and counter attacks from Lees-McRae, Clemson, and Emory kept the pace high enough to hold off an organized chase that whittled down the break’s lead from 40 seconds at the halfway point to only 9 seconds in the closing laps. Knowing that MHC’s best chance for the win was to put Knott in a position to sprint in the last lap, MHC’s Paul Webb (who was also in the break) chased down numerous attacks to ensure that Knott had his chance. Webb was leading the overall individual conference standings heading into the Furman race weekend and sacrificed his own chance to gain valuable points in order to help his team win. 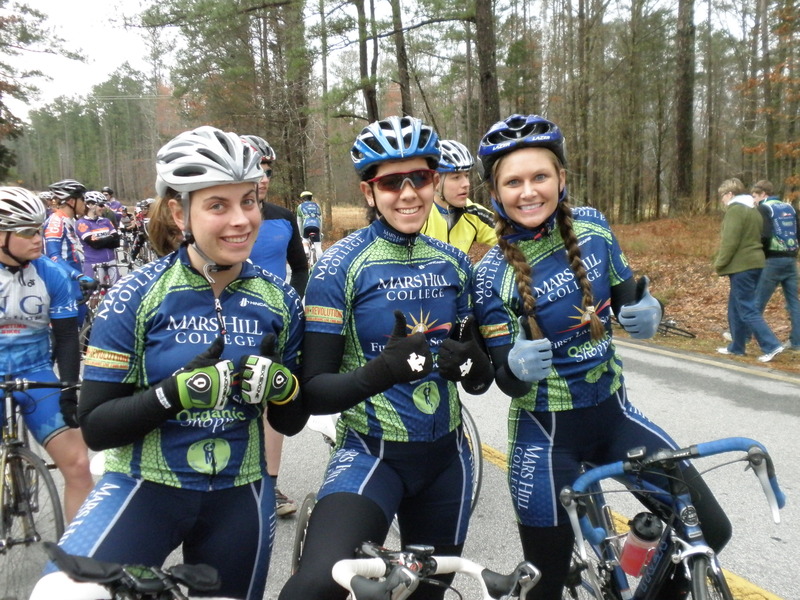 A report and video of the win can be found on the Carolina Cycling News website HERE. Other strong performances over the weekend include Klara Rossouw’s 3rd place in the road race, Yolanda Colon’s return to form with a strong 4th place finish in the women’s A criterium, another 4th place for Melissa Holloway in the women’s B criterium, a top ten for Ryan Levander in the men’s C criterium, and a strong 3rd place finish in the men’s A Team Time Trial behind Furman (reigning TTT national champions) and Lees-McRae (former TTT national champions). MHC continues to lead the team overall rankings, and Klara Rossouw continues to lead the women’s individual overall rankings. Webb should remain in the top 3 in the overall individual rankings. The next race at University of Alabama-Hunstville will be the final regular season event on April 10-11, followed by the Southeastern Conference Championships the next weekend on April 17-18, which Mars Hill College is proud to host. As always, big thanks to the team’s sponsors and supporters. Short story, everyone on the team did their very best as an individual in order to support teammates and maintain our team lead at the Georgia Tech events last weekend. In the process, we did in fact maintain our team lead in the SECCC Division II rankings, accumulating 417 points to this point in the season. Second place Furman has 179 points. And King College is in third with 174 points, not far behind. Klara Rossouw, despite being once again severely outnumbered and having only one A teammate against Lees-McRaes’s onslaught of talent, persevered and continues to lead the individual Women’s A Omnium with 442 points over Lees-McRaes’s Rachel Warner who sits in second with 297 points. Emily Fancher is in third with 266 points. Paul Webb vaulted from third overall in the conference to first due to his consistent, strong, and smart riding and now has 368 individual points. Still, he only leads Clemson’s Ben Zawacki by 3 points, with Florida’s Shawn Gravois close in third with 333 points. Winning the team omnium for the Southeastern Conference remains our primary objective; leading both the men’s and women’s individual A categories just kind of flowed from that priority. We will continue to fight and make the team omnium our priority, knowing that our toughest races are ahead of us. The team will be doing reconnaissance rides of the upcoming courses at Furman over the next week. 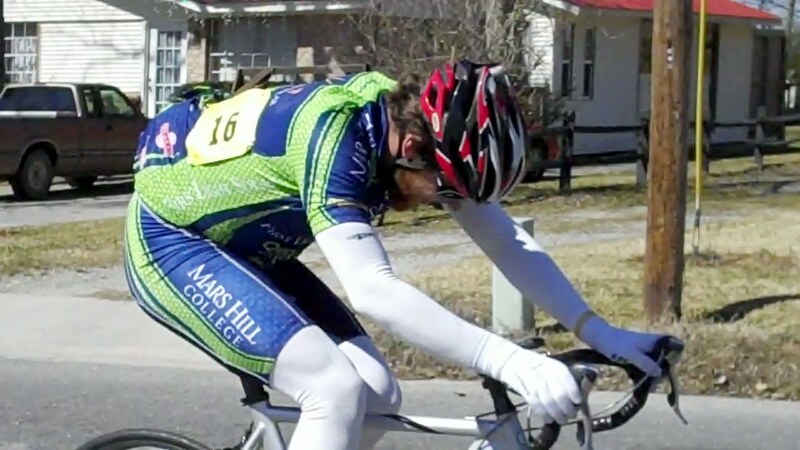 Don’t forget that MHC is hosting the Southeastern Collegiate Cycling Championships on April 17-18 in Mars Hill and Asheville. More on that soon, but we welcome your inquiries regarding volunteering, sponsorship, and participation in this marquee event that will decide who represents the SE Conference at the National Road Championships in Madison, WI, on May 7-9. As always, huge love to our sponsors/supporters. You are integral to our continuing success. Mars Hill Cycling loves you. Thanks to everyone for showing up and selling out RATS and A Ride with George last night. We’re preparing for tomorrow’s racing at Georgia Tech. One of our sponsors rented us a huge house with an indoor swimming pool! Mars Hill Cycling loves our sponsors. And we love you! We were wondering when the bigger dogs would start coming out to play, and (with the notable absence still of Brevard College) the best of the Southeastern Conference were on the line at Georgia Southern University last weekend. Lees-McRae showed up in full force, as did Furman University and Cumberland, two of the strongest teams in Div II. Still, at the end of the weekend’s racing, MHC still maintains its overall team omnium lead and Klara Rossouw still leads the women’s A overall rankings, with Paul Webb riding to a superb 3rd place in the road race to maintain his 3rd overall ranking in A men’s individual omnium. Here’s the rundown on the weekend’s events. In the TTT, the MHC women’s team of Klara Rossouw, Yolanda Colon, and Melissa Holloway placed 1st in our Div II. The course was fast, and Furman blew everyone away in the Men’s A TTT with MHC finishing a few minutes down but still in 2nd place in our division. While our guys lacked the TT equipment to compete on an even playing field, Furman would still have beat us quite handily. But the MHC boys are improving weekly, and they will have better TT set-ups for the conference and national championships. The criterium was held on a very short and fast course with eight corners to negotiate every lap. With horsepower from Lees-McRae and Furman driving the pace from the gun, the starting field of 45 was reduced to less than half soon after the start. The MHC team rode well to start with Matt Willing sitting in 2nd and covering LMC riders for the first five laps, but the effort took its toll, and by the end of the race Paul Webb and Matt Willing barely made it into the top 20 in 19th and 20th respectively, earning valuable points for the team. Zach Felpel of LMC won ahead of Chris Butler from Furman. The women’s race was dominated by the LMC women who had eight of the thirteen starters in the A women’s event. Klara could only follow so many attacks and eventually had to settle for 7th as LMC women took the first six spots. Yolanda Colon wasn’t too far back and earned more points for the team. Rachel Warner won the women’s criterium in a solo effort. Melissa Holloway from MHC placed a strong 5th in the Women’s B event, her first race of the year. The road race was held on a 22-mile loop that offered wind and rolling hills to break up the fields. In the Men’s A race, a break of six formed on the first lap and included MHC’s Paul Webb, Chris Butler (Furman), two LMC riders, Alejandro Padilla from Cumberland, and a UF rider. With most of the big teams represented, the break stayed away but splintered on the last lap with Chris Butler taking the win ahead of Brad Perley (LMC) and Paul Webb. MHC’s Kyle Knott took the field sprint for the 3rd consecutive race. The women’s A race was a little confusing as many riders were accidentally led off course. In the end it was sorted out and Rachel Warner (LMC) again won and MHC’s Klara Rossouw rolled across the line in 5th. Melissa Holloway (MHC) earned another strong 6th place result in the Women’s B road race and now sits in 11th overall after competing in just two events. Thanks to all of our sponsors, supporters, and partners. We expect the level of competition to continue to increase leading up to conference championships. Bring it on!